Complex Earth system models, such as the model of the Max Planck Institute for Meteorology (MPI-ESM), have a reduced resolution for climate applications. Increasing the resolution in a coupled model results in improved atmospheric and oceanic dynamics and reduces biases in mean states and variability of many meteorological and oceanographic quantities. It improves, for example, atmospheric blockings and storm tracks. On the other hand, increase of resolution often comes with unexpected problems such as a weak Atlantic Meridional Overturning Circulation (AMOC), which is an important component in the Atlantic-Arctic climate system. A stable coupled climate model can therefore only be obtained by consideration of both atmosphere and ocean when the model resolution is increased. Taking the lead, Dr Wolfgang Müller, group leader in the department "Ocean in the Earth System" at MPI-M, developed a high-resolution version of MPI-ESM1.2 with a stable coupled climate together with his colleagues. It will also be used for the next generation of seasonal and decadal predictions (MPI-ESM-HR, Müller et al. 2017). Together with another low-resolution version of MPI-ESM1.2 (MPI-ESM-LR), and a low resolution of the new Earth system model ICON (MPI-ESM2), the MPI-ESM-HR takes on the global comparison of coupled climate models (CMIP6 - Coupled Model Intercomparison Project Phase 6). The CMIP6 activities at MPI-M are scientifically and technically coordinated by Dr Matthias Bittner and Karl-Hermann Wieners. Dr Wolfgang Müller heads the group "Decadal Climate Predictions" which aims at developing a global system for climate predictions covering a period of one to ten years. The group is part of the Germany-wide project MiKlip which promotes basic research on decadal climate predictions and takes the decadal predictions into operation at Germany's National Meteorological Service Deutscher Wetterdienst. For the description of the physical processes and their application in the field of decadal climate prediction, an increase of the model resolution is required and thus the development of MPI-ESM-HR is an important step. For its atmospheric components, MPI-ESM-HR has a horizontal resolution of approximately 100 km. Its previous version, which was used for CMIP5, had a resolution of about 200 km. The impacts of increasing the resolution in MPI-ESM1 (ECHAM) have been documented in a couple of atmospheric model intercomparisons projects (AMIP) [Hertwig et al., 2015]. In a lengthy process, MPI-ESM-HR has been tuned with regard to many criteria of the coupled climate (radiation budget, atmospheric and oceanic circulation, sea ice, ocean biochemistry, climate sensitivity). For this purpose, the model was run for several thousand model years and the necessary parameters were adapted. The result is a radiation-balanced version with presentable values for the average climate and well-known ocean currents, such as the Atlantic overturning circulation. It is at a stable level of 17 Sverdrup (at 26 ° N and at a depth of 1000 m) and matches the estimates of the observations. Compared to the MPI-ESM-LR, the MPI-ESM-HR is particularly distinguished by an improvement of the atmospheric dynamics. This can be seen in storm tracks and blockings over the North Atlantic-European region. 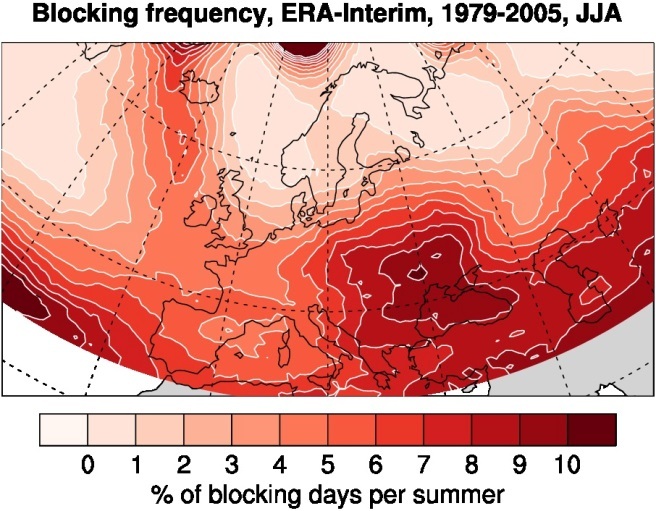 Figure 1 shows, for example, the percentage of blockings in summer for Europe. 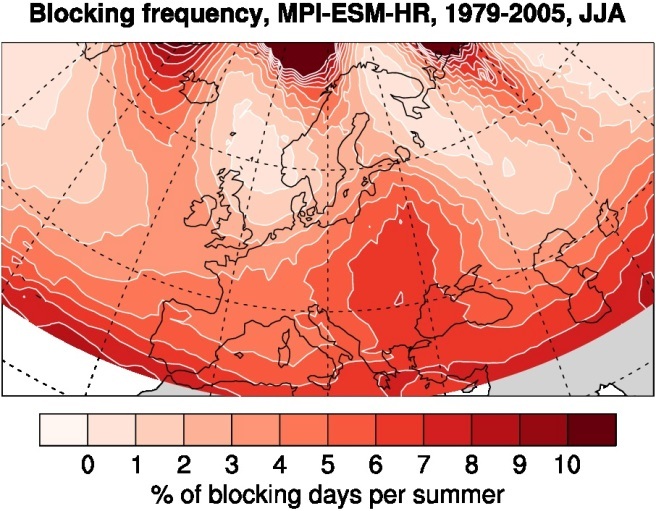 Blockings are responsible for heat waves in summer in Europe. However, their frequency is still underestimated in coupled climate models, partly due to the relatively low resolutions. In our example, it is clear that the number of blockings can be improved by increasing the atmospheric resolution. A similar development, albeit less obvious, can be observed for the winter months. Nevertheless, deviations from the observations remain considerable, indicating that a further resolution increase or other improvements are necessary. 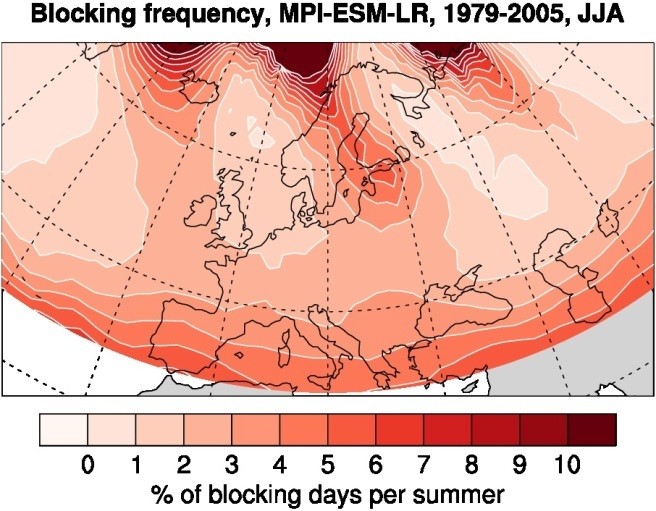 Figure 1: Blocking frequencies for summer (JJA) for (a) ERA-Interim, (b) MPI-ESM1.2-LR and (c) MPI-ESM1.2-HR. Shown are the percentage of blocking days per season. The results for MPI-ESM1.2-LR and MPI-ESM1.2-HR are based on an ensemble mean for the period 1979-2005. Units are in percentage [%]. MPI-ESM-HR is one of the models MPI-M participates with in the international model intercomparison CMIP6 (Eyring et al., 2016). With reference to the "Grand Science Challenges" of the World Climate Research Program (WCRP), CMIP6 tries to answer three broadly defined questions: (i) how does the Earth system react to forcings/perturbations (ii) what are the origins and consequences of systematic model deviations, and (iii) how to assess future climate change given climate variability, predictability, and uncertainty? 1. A small number of standard experiments, called DECK (Diagnostic, Evaluation and Characterization of Klima experiments), and historical simulations from 1850 to the present. DECK consists of a control experiment with steady boundary conditions, idealized climate change experiments and an AMIP simulation from 1979 to 2015, which uses observational data for the temperature and sea ice changes. 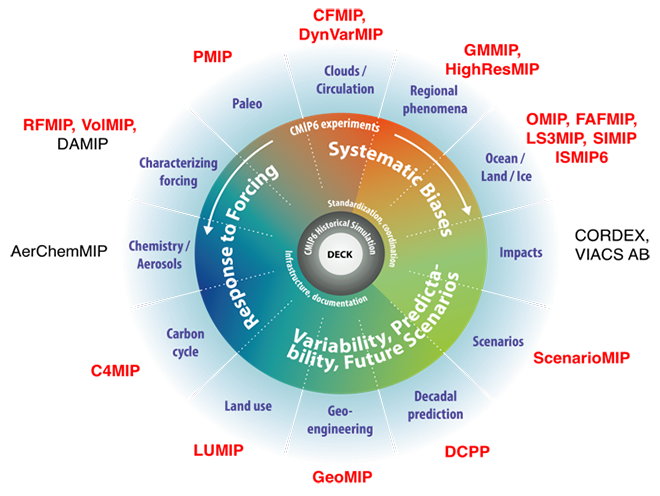 The DECK simulations serve to evaluate and characterize the model and allow systematic comparisons of basic climate characteristics of different Earth system models. 2. Mandatory data formats, collaborative data storage and documentation of the experiments to facilitate the international distribution of the model results and their evaluation. 3. Further experiments of CMIP6-supporting model intercomparison projects (MIPs) on specific questions. In these projects, a specific question is examined in detail in connection with the three broadly defined questions of CMIP6. Figure 2: Schematic of the CMIP6 experiment design (Eyring et al., 2016). The inner ring and surrounding white text involve standardized functions of all CMIP DECK experiments and the CMIP6 historical simulation. The middle ring shows science topics related specifically to CMIP6, which are addressed by the CMIP6-endorsed MIPs. The topics and MIPs are shown in the outer ring, where MIPs with active participation by the MPI-M are highlighted in red. MPI-M scientists are involved in 17 of the 21 different MIPs (Figure 2), often playing a leading role in the formulation of key scientific questions and experiment design. Examples from the three departments at MPI-M include the Decadal Climate Prediction Project (DCPP), the Radiative Forcing MIP (RFMIP), and the Coupled-Climate Carbon Cycle MIP (C4MIP). DCPP (Boer et al., 2016) is coordinated by Dr Wolfgang Müller and investigates the prediction of climate states on decadal time scales, using the MPI-ESM-HR in particular. Retrospective predictions of the past century (hindcasts) are calculated in order to both examine the limits of predictability given the internal climate variability and to assess actual predictions of coming decades. This is intended to provide a basis for the operational application of such calculations. Prof Dr Bjorn Stevens and Dr Stephanie Fiedler from the department "The Atmosphere in the Earth System" are responsible for RFMIP (Pincus et al., 2016). It examines the characterization of the effective radiative forcing and its uncertainty in order to assess, inter alia, the accuracy of radiation parameterizations in climate models. The carbon cycle, and its description in climate models, is the focus of C4MIP (Jones et al., 2016), which is carried out at MPI-M by Prof Dr Victor Brovkin, Dr Tatiana Ilyina, Dr Julia Pongratz and Dr Thomas Raddatz, scientists in the departments "The Land in the Earth System" and "The Ocean in the Earth System". Especially the question to which extent feedbacks and interactions in the carbon cycle can influence the remaining of anthropogenic CO2 in the Earth system - which can have a major impact on the emission targets for stabilizing global climate - is explored. In addition to the already described MPI-ESM-HR, which is used in the historical simulations as well as in the MIPs with a focus on climate projections (ScenarioMIP) and decadal predictability, a model version with a lower resolution of the MPI-ESM1.2 (MPI-ESM-LR) will be used in CMIP6. The MPI-ESM-LR is particularly interesting for the MIPs, because they have to be able to calculate many simulation years, which is possible due to the lower resolution of MPI-ESM-LR. Furthermore, the carbon and nitrogen cycles are implemented and vegetation changes get dynamically calculated, which is why MPI-ESM-LR is also used in MIPs with an interest in land processes (LUMIP, LS3MIP). In addition, the new ICON-based Earth system model MPI-ESM2 will be used in CMIP6. This gives the opportunity of comparing the new MPI-ESM2 to existing climate models and getting evaluations of scientists worldwide. In this context, an important partner of MPI-M is the German Climate Computing Centre (DKRZ). In a project funded by the Federal Ministry of Education and Research (BMBF), led by DKRZ, MPI-M is with other national scientific institutions responsible for the German contribution to the sixth report of the Intergovernmental Panel on Climate Change (IPCC). Among other things, scenario simulations will be carried out with the MPI-ESM-HR for the assessment of future climate change. Giorgetta, M. A., et al. (2013), Climate and carbon cycle changes from 1850 to 2100 in MPI-ESM simulations for the Coupled Model Intercomparison Project phase 5, J. Adv. Model. Earth Syst., 5, 572-597, doi:10.1002/jame.20038. Hertwig, E., J.-S. von Storch, D. Handorf, K. Dethloff, I. Fast, and T. Krismer (2015), Effect of horizontal resolution on ECHAM6-AMIP performance, Clim. Dyn., 45 (1), 185-211. Boer, G. J., Smith, D. M., Cassou, C., Doblas-Reyes, F., Danabasoglu, G., Kirtman, B., Kushnir, Y., Kimoto, M., Meehl, G. A., Msadek, R., Mueller, W. A., Taylor, K. E., Zwiers, F., Rixen, M., Ruprich-Robert, Y. and Eade, R.: The Decadal Climate Prediction Project (DCPP) contribution to CMIP6, Geosci. Model Dev., 9(10), 3751-3777, doi:10.5194/gmd-9-3751-2016, 2016. Eyring, V., Bony, S., Meehl, G. A., Senior, C. A., Stevens, B., Stouffer, R. J. and Taylor, K. E.: Overview of the Coupled Model Intercomparison Project Phase 6 (CMIP6) experimental design and organization, Geosci. Model Dev., 9(5), 1937-1958, doi:10.5194/gmd-9-1937-2016, 2016. Jones, C. D., Arora, V., Friedlingstein, P., Bopp, L., Brovkin, V., Dunne, J., Graven, H., Hoffman, F., Ilyina, T., John, J. G., Jung, M., Kawamiya, M., Koven, C., Pongratz, J., Raddatz, T., Randerson, J. T. and Zaehle, S.: C4MIP - The Coupled Climate-Carbon Cycle Model Intercomparison Project: experimental protocol for CMIP6, Geosci. Model Dev., 9(8), 2853-2880, doi:10.5194/gmd-9-2853-2016, 2016. Pincus, R., Forster, P. M. and Stevens, B.: The Radiative Forcing Model Intercomparison Project (RFMIP): experimental protocol for CMIP6, Geosci. Model Dev., 9(9), 3447-3460, doi:10.5194/gmd-9-3447-2016, 2016. Lawrence, D. M., Hurtt, G. C., Arneth, A., Brovkin, V., Calvin, K. V., Jones, A. D., Jones, C. D., Lawrence, P. J., de Noblet-Ducoudré, N., Pongratz, J., Seneviratne, S. I., and Shevliakova, E.: The Land Use Model Intercomparison Project (LUMIP) contribution to CMIP6: rationale and experimental design, Geosci. Model Dev., 9, 2973-2998, doi.org/10.5194/gmd-9-2973-2016, 2016.